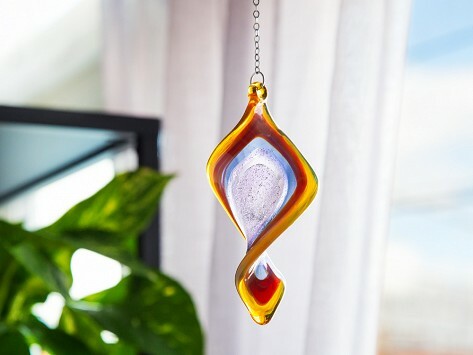 A cremation glass art suncatcher is a loving way to remember the spirit of a pet who has passed away. Artist Tari Zarka’s unique designs are made with an animal’s ashes. She places the ashes—individually—into durable, borosilicate glass as it’s being crafted in a suncatcher. The result is a beautifully-made and meaningful memento that celebrates the life of a beloved companion. Made in the USA and Made for a Lifetime. Dimensions: Small: 3.5" x 1.5" x 1.5"; Large: 6" x 1.5" x 1.5"
Weight: Small: 0.1 lb. ; Large: 0.15 lb.